Harvest a bushel of blessings with this new series by Karla Dornacher. Order Fruit of the Spirit note cards and share God's gift of peace, kindness, joy and love with others. 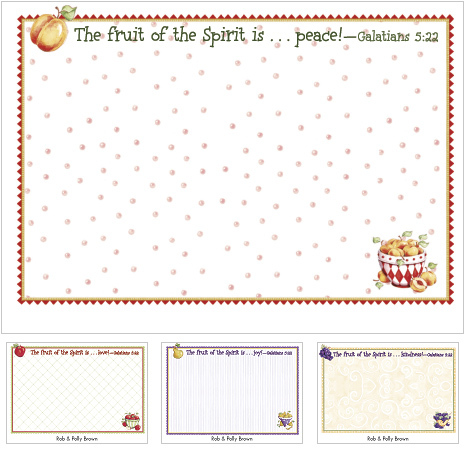 This sensational series based upon Galatians 5:22 is comprised of grape cards, peach cards, pear cards and apple cards. These 6 1/4" X 4 1/2" flat cards include free personalization and envelopes.